What does it mean to really belong in Richmond? How do our homes shape how we think of who belongs? What solutions and actions are needed to achieve a city where everyone belongs? The stories, poetry, data, images, and policies that make up this report center on these questions. but do they even think I’m human? Like this poem, much of the research and creative development of this report was done by the Staying Power Fellows, a group of Richmond residents impacted by the housing crisis who over the past year carried out interviews, analyzed data, read reports and analyzed their own experience. For example, the Foundations of the Housing Crisis diagram comes out of a root-causes analysis that the fellows developed. Fellow Noe Gudino researched the Source of Income Discrimination policy, which lead to the concept of a Reusable Tenant Screening Report. From their research, the fellows wrote and publicly performed poetry, developed a large public mural, drafted policies, and are sharing all of this work with their communities. Sasha Graham-Croner’s preface to the print version of the report provides a powerful framing for the need for leadership and research led by people directly impacted by the housing crisis. The research in this report also comes from the insights and ongoing work of many Richmond-based organizations and other residents. On June 3, 2017, eight organizations co-sponsored a Citywide Housing Symposium, where over 100 participants discussed housing issues in Richmond and policies to address them. Public spaces for community leaders working on these issues have also been a source and a sounding board for the research, including the GRIP Social Justice Forum and the Richmond Progressive Alliance Housing Action Team. Recognizing that there is no single solution or silver bullet to the housing crisis affecting so many not only in Richmond, but nationwide, we set out to research and develop a comprehensive set of Housing Policies for Belonging that could be implemented at the local level. In the past five years, Richmond has passed, implemented, and explored a number of innovative local policies to address the housing crisis, many of which are covered in our Existing Housing Policy section. This report seeks to build on this inspiring work. There may be gaps where we did not recognize or fully understand an issue, were not able to develop a solution, or could not address issues originating outside the scope of local policy action, so this is ultimately a work in progress and a living document that will only be as valuable as the collective work that goes into adding, refining, and trying out the ideas and strategies here. The research here also benefits from the insight of numerous policy experts and Richmond residents who have reviewed and provided feedback to the report. The Haas Institute staff carried out quantitative data analysis, mapping, policy analysis, and legal research, and we take full responsibility for the report. To navigate this online report, you can view individual sections and policies to the right. Brief introductions for each section are below. What is clear from our analysis of data on housing in Richmond is that the squeeze on low-income renters, and Black people and Latinos in particular, has been building since the foreclosure crisis some 10 years ago. Foreclosures in Richmond spiked more than 600 percent between 2005 and 2008. One of the effects of the crisis was that many homes lost to foreclosures became rental properties, decreasing the percentage of Richmond households who own their home from 61 percent in 2005 to 49 percent in 2015. Substantial racial inequities exist in homeownership in the city: A majority of Black (60 percent) and Latino (63 percent) households are renters, compared to 36 percent of white households and 29 percent of Asian households. On the heels of the foreclosure crisis came a rise in speculative investment, with cash purchases making up about half of all home purchases in Richmond between 2009 and 2012. The asking rent in Richmond began to rise dramatically in 2013, going up 9 percent from 2013 to 2014, and 19 percent from 2014 to 2015, then only 4 percent through 2016, and not increasing through November 2017. Meanwhile, most of the new jobs that opened in the East Bay were either very low wage or very high wage. Between 2009 and 2016, 100,000 new jobs were added in occupations that have a median wage of less than $15 per hour, and 100,000 jobs opened in occupations with median wages $50 per hour or higher. The unemployment rate in Richmond came down, but the median income didn’t go up. When housing costs go up, but incomes do not, affordability worsens. This has hit low-income renters the hardest: the percentage of Richmond renters who are overburdened by their housing costs increased from 34 percent in the year 2000, to 46 percent in 2015. The production of housing that is affordable to low- and very low-income households has lagged far behind what is needed, worsening the shortage of affordable housing. From 2007 to 2014 Richmond permitted 31 percent of its target number of low- and very low-income units, and yet most cities in Contra Costa performed even worse, with jurisdictions in the county all together permitting only 22 percent of such units. In addition, most of the affordable units that were built recently were not located in neighborhoods with the resources and amenities to support healthy families. Looking at the affordable housing that was produced in Richmond using the Low Income Housing Tax Credit (LIHTC), all of the units were located in either low or lowest resource neighborhoods. While most of the neighborhoods in Richmond fall into either the moderate or low resource categories, none of the LIHTC affordable housing projects were built in the areas of Richmond with better amenities. This limits access to resources and opportunity for the low-income residents of these units, threatening to reinforce patterns of income and racial segregation. The decisions that shape access to healthy, dignified homes and neighborhoods often are cloaked in complicated jargon and made in exclusive spaces. The structures and systems that result from these actions are frequently unseen and yet they deeply impact our lives. During the foreclosure crisis, for instance, many of us learned about securitization and subprime loans only after the damage had been done. Many decisions made about what kind of development can happen and where it can happen often move through administrative channels that are not easily accessible. Housing policy is most effective when it addresses these more structural forces, advancing structural inclusion. From a policy perspective, structural inclusion means that social, legal, and economic structures are designed to provide everyone access to resources essential for a full sense of belonging and wellbeing. In analyzing and developing policy, the Haas Institute uses a framework we call targeted universalism. The term “universalism” refers to the idea that there should be a universal goal that will be achieved; for instance, making housing affordable for all residents. But for all to reach that universal goal, the policy must also be “targeted,” meaning it must include strategies specific to the particular barriers that some people face and others do not. For example, ensuring that the goal of affordable housing is achieved for seniors on a fixed income will require different strategies than reaching the goal for middle class homeowners. Richmond’s Health in All Policies ordinance reflects a targeted universalism framework: “Health equity entails focused societal efforts to address avoidable inequalities by equalizing the conditions for health for all groups, especially for those who have experienced socioeconomic disadvantage or historical injustices.” Often, the benefits of a targeted strategy also reach beyond the targeted population, such as how affordable housing for seniors creates stronger intergenerational communities and lessens medical costs. The universal goals for housing policy must recognize that housing is about much more than just shelter. The home that you live in ties you to place, and this has a profound effect on your access to safe, healthy environments, economic opportunity, education, essential social networks, and other resources. These neighborhood environments can have substantial long-term economic and health effects. In the United States, owning a home is the primary way most working class families build wealth, which can protect them from a temporary loss of income or major expense like surgery or college tuition. Housing policies that further the power of residents create new pathways and platforms for residents’ voices to be heard and shape housing decisions. For example, the creation of a Community-owned Development Enterprise (CDE) would put residents in the driver’s seat of designing and carrying out housing development projects. A housing speculation tax curbs and deters speculative investment, increasing the power of moderate-income home buyers and tenants in the housing market. The process itself can build the power of residents when they participate in developing, advocating for, and passing policy. Home is housing-animated— it is where the people, experiences, objects, and memories that make up our day-to-day lives are knotted together with broader relationships to people, places, and moments. Home is like scent, it evokes memory, accessing those parts of the brain that pull at emotions—good, bad, and intense. Home is where housing and belonging come together. In this report we refer to “belonging” as not merely about having access to opportunities and resources, but being able to make demands upon political and cultural institutions. Belonging means being seen, listened to, and responded to at a structural level. In the San Francisco Bay Area, discussions on housing are endless—the shortage, the prices, the displacement, the inequality. In Richmond, a campaign to pass rent control and just cause for eviction laws in 2015 brought together Richmond renters, landlords, and local organizations into a powerful campaign to demand tenant protections from rising costs and unjust evictions. In demanding structural protection, they were asserting their belonging. Their efforts were met with disdain from some elected officials in Richmond and rent control opponents. During one packed council meeting, a council member took the microphone and asked the audience to not be distracted by the stories of residents in the face of the facts that he had compiled. This framing of (his) facts vs. (their) testimony and lived experience was a false one; proponents had also done extensive research that showed statistical and factual justifications for rent control. At the root, his ask was a statement of dis-belonging—the experience of the marginalized is not how to direct the priorities of government. Such asks—and nearly $200,000 spent in opposition to the ballot vote on rent control—ultimately failed; rent control and just cause for eviction won at the ballot in 2016 with 65 percent of the vote and Richmond became the first city in California to pass a new rent control ordinance in over 30 years. This was followed in late-2016 with another housing policy designed for formerly incarcerated people and advanced by a coalition of organizations such as the Safe Return Project and others. The Fair Chance Housing Ordinance prohibits public, low-income, and affordable housing providers from inquiring about prior convictions of an applicant—a “ban-the-box” for housing. While only two tools in the broader efforts to make an equitable housing landscape in Richmond, these victories signal the importance and power of housing policies that advance belonging. While making explicit who does belong, they also support the stability of residents by offering some protection from the impacts of the housing crisis—a burden most heavily shouldered by Black, Latino, and low-income residents. Importantly, the victories also reflect the power of residents acting together to shape city policy that reflects their communities, an outcome that is contagious in its action-oriented hopefulness. “This body embody Richmond,” stated an organizer deeply involved in passing Fair Chance Housing. This is a statement of belonging—the experience and collective action of the historically excluded directing the priorities of government for the people. Housing remains one of the defining factors of our lives. As author Matthew Desmond puts it bluntly, “Rent eats first.” Housing policies for belonging do not only have housing as their sole goal. Housing policies for belonging must address the ongoing impacts of racism and economic exclusion by inverting historical and contemporary place-based disenfranchisement; racial exclusion from homeownership is the single biggest factor in the racial wealth gap that today means the average white household wealth is seven times that of Black wealth and five times that of Latino wealth; education quality is intimately tied to where people live, a factor shaped by housing policy, zoning, and tax code; housing access and zoning have resulted in disproportionate exposure to environmental pollution for low-income people of color; and racial residential segregation can increase toxic stress with long-term negative health outcomes. One of the end results of these inequities is that Black residents in Richmond have been displaced from their historic neighborhoods, whether through the rising costs of housing, in pursuit of better education, or out of safety concerns. In Richmond, the Black population has fallen from 36,600 in the year 2000 to 23,500 in the year 2015 (a 36 percent decrease). Stable, affordable, quality housing and the ability to move if one wants to—not to be driven out by violence, rising prices, failing schools or exclusionary policies—provide undeniable foundations for the thriving of Richmond residents and the city as a whole. Policies of belonging mean that structurally excluded residents can benefit from the improvements of place and development that are happening, and will continue to happen, in Richmond over the long-term. 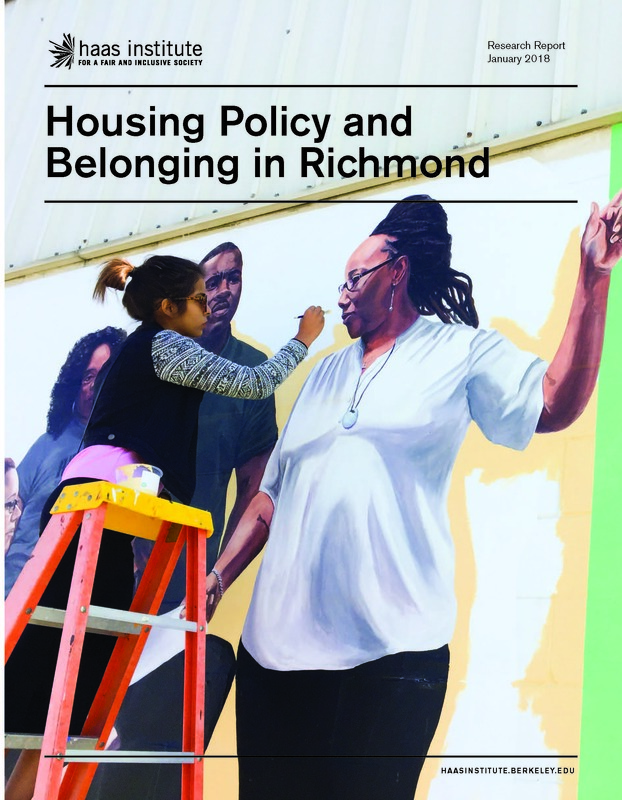 By supporting Richmond as home, housing policies for belonging are not an end, but a framework for expanding the health, wealth, and power of Richmond residents.